Frequency analysis (FFT) of the octave F2-F3 (1 and 4 blow) for sound and volume comparison: same distance to the measuring microphone, identical playing pressure: The 1847 Low plays louder and sounds fuller (blue curve) - the peaks at 355 and 532 Hz (fundamental frequencies) are stronger compared to the the Favorite (black curve); refer also to the envelopes. FEEL THE POWER OF STAINLESS STEEL REEDS. Nearly all musical instruments have their own resonance chambers. High-pitched instruments (for example, alto and soprano) require a smaller resonance chamber whereas low-pitched instruments (for example baritone and bass) require a larger resonance chamber. The harmonica has no built-in resonance chamber for amplifying sonic waves. How is a full and loud tone produced with a harmonica? Harmonicas produce sound by a free-reed system. As you introduce air to the harmonica, either blowing or drawing, the reeds are actuated, rapidly moving up and down, cutting the airstream and produce the sound you hear. Higher-tuned reeds move faster producing the higher-frequency of sound. Low-tuned reeds move more slowly, cutting the airstream at a lower frequency, producing the low, sonorous tones. The resonance chamber in the case of the harmonica is the provided by the player. The player’s mouth cavity forms the resonance chamber creating a functional unity between player and instrument. For this reason, the shape of the player’s mouth cavity is crucial to the tone produced by the instrument. An expanded mouth cavity and deep, diaphragmatic breathing combine to produce strong, fat tones. The principle of opening the jaw to form a larger resonance chamber is also used by singers who produce loud sounding low notes (like vocalizing the low-sounding vowel "Oh"). The SEYDEL 1847 Low-series (LLE to LF#) incorporate a thicker comb with deeper coverplates. This encourages the player to adopt the wider embouchure and form a larger resonance chamber (mouth cavity). Additionally the new coverplate design has a very positive influence on sonority and volume by creating greater sound projection towards the audience through the wide-opened back of the instrument. These fundamental improvements help to make the low notes sound fuller than on other low-tuned harmonicas without this special baritone design. The 1847 NOBLE is now available in super-low tunings, redesigned to include a 20% thicker comb and raised coverplates. Available keys range from LF# (low F sharp) down to LLE (double-low E). 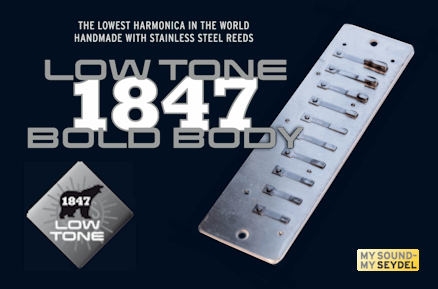 This innovation expands our 1847 line of Stainless Steel reed harmonicas to include the extreme bass range. The double-low models (LL) are tuned two octaves lower than standard, making SEYDEL’s 1847 LLE the lowest tuned diatonic harmonica worldwide. In comparison to the 'standard tuned' models, low-tuned harmonicas offer a very sonoric, slightly softer and unobtrusive sound making them an excellent choice for accompaniment (chords or bass lines) as well as for soloing. Their sound is similar to that of a tenor saxophone, a trombone, or even a tuba, especially if played amplified. This considerably extends the range of application and opens many new possibilities for harmonica players. To get the desired sound out of the low-tuned models the notes need more space. The resonance chamber, increased by the 20% thicker comb (anodized black aluminium) and the higher coverplates of the new 1847 Low models, help to produce a fatter and louder sound. Special valves ensure very good airtightness even in the extrem low range. This design change has a positive impact on sonority and tonal control of the 1847 Low models. While the player is animated to open his or her vocal tract slightly more to increase the resonance chamber, the improvements in design, such as the thicker comb aid in creating the larger resonance chamber, yielding a superior, low sound. The sound becomes fuller and more voluminous and the instrument can be played with a better response. Thanks to the raised coverplates rattling reed noise is a thing of the past and players get a greater sound projection towards the audience through the wide-opened back of the instrument.